Fixed position loading Systems - G & W Machinery Sales, Inc.
Grippers for different EROWA tooling to be ordered seperatly. 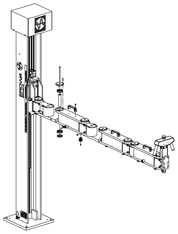 Manipulator to be installed in front of a machining center where frequent changes of pallets are required. Adaptions for all EROWA Tooling are available. Grippers for different EROWA tooling to be ordered separately. Manipulator to be installed in front of a machining center where frequent changes of pallets are called for. Possible adaptions for all EROWA Tooling.